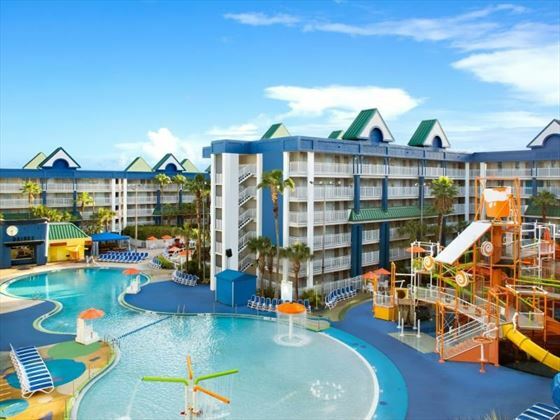 Following a $30 million renovation in March 2016, Holiday Inn Resort Suites & Waterpark is a fantastic, family-oriented retreat offering 777 newly renovated, colourful suites only a mile away from Walt Disney World Resort. The kids will love this all-suite resort, especially thanks to its two impressive waterparks featuring 13 exhilarating water slides and flumes, as well as cosy cabanas and a poolside bar for mum and dad to soak up the sun and sip on a cocktail or two. Hungry families will also relish the food court in the Marketplace, offering a variety of fun, tasty restaurants the whole family will enjoy, including the Lakeside Café international buffets, and the wood-fire pizzas at Antonio’s Pizzeria. Like to shop ‘till you drop? The resort is home to a brilliant on-site mall with shops, entertainment and restaurants, as well as a complimentary scheduled shuttle service to the major Orlando attractions. Close-by to the vibrant Lake Buena Vista, this fantastic resort is only a mile away from the thrilling Walt Disney World Resort theme parks, as well as a quick 20 minute drive to Universal Studios and Islands of Adventure. Two expansive shopping centres, Orlando Premium Outlets and The Mall at Millenia, are easily accessible too. 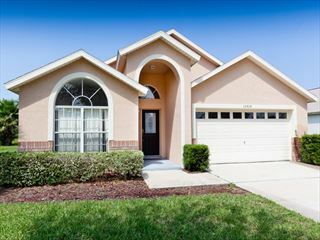 The resort is a 20 to 30 minute drive from Orlando International Airport. Room service available 5pm to 10pm daily. Lakeside Café – A casual, family-friendly restaurant offering a la carte and buffet menus for breakfast and dinner. Cravings – A delicious café featuring classic bakery favourites and Starbucks coffee. Kids will love a scoop of Hersey’s Hand Dipped Ice cream. Open for breakfast, lunch and dinner. Antonio’s Pizzeria – Featuring a classic Italian menu of freshly fired, hand tossed pizzas made right in front of you, as well as family favourites such as chicken nuggets, burgers, and French fries. Open for lunch and dinner. Stackers Deli – Tuck in to delightful, freshly made sandwiches and salads for lunch and dinner. Lagoon Grill and Bar – Nestled next to the Lagoon Pool, head her for a delicious menu of burgers, hot dogs, salads and various snacks. Open for lunch. Hideaway Lounge – A great spot for adults to sit back, relax, watch some TV, and grab a quick bite to eat. Complimentary scheduled shuttle service from the shopping centre to the theme parks. Prices correct as at 6pm on 18 Apr 2019. Please call for final price. Prices are per person based on 2 adults & 2 children sharing. Other durations available - call for quote. Prices include flight and accommodation as stated below. Great value transfers or car hire packages with Dollar rent-a-car are available, please ask your Florida travel expert for more information. For the purposes of the prices above, children are assumed aged 11 and under. Teen prices also available.